CLE Connect is more than just a program for earning CLE credits. We designed each course specifically for Minnesota lawyers to discover their unique strengths and use them to grow their practices. We like to think the CLE credit is just the icing on the cake. We are constantly adding new courses and materials, so our site is always evolving. 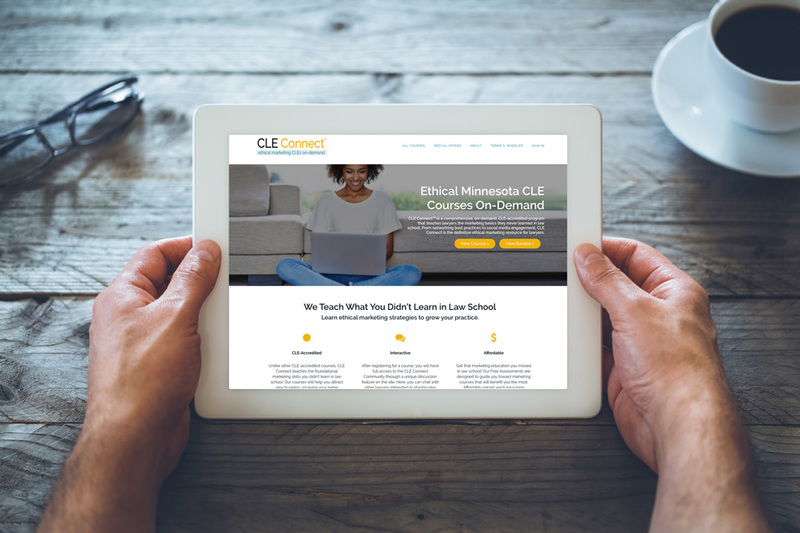 CLE Connect is a comprehensive, on-demand, CLE-accredited program that provides you direct access to the marketing education and training your law school didn’t offer. CLE Connect has been created from Terrie S. Wheeler’s work with hundreds of lawyers and law firms over the past 25 years. From creating your individual marketing plan and networking best practices, to social media engagement and using your website to develop business, CLE Connect is the definitive marketing resource you need to grow your practice. What really makes CLE Connect unique, however, is its ease of use, affordability, and quality of content. In addition to presentations from Terrie on marketing best practices for lawyers, you also have access to the course curriculum that includes marketing tools, tip sheets, check lists, templates, and everything you need to develop and implement your personal marketing plan. Why is this unique? Because you will use our materials for years into the future. What you learn on CLE Connect will shape and guide your growth now and into the future. While each CLE Connect course has been approved for one CLE credit, that’s not where the true value of our program lies. We’ve found that the most valuable aspect of CLE Connect is the collaborative nature of its virtual community. After signing up for a course, you join a community of lawyers across the country who value learning and sharing marketing strategies, expanding their professional networks, and growing their practices. If you sign up for just one course, you gain access to our unique discussion feature. The discussion board is where you can find direct access to CLE Connect President and Founder, Terrie S. Wheeler, as well as to compare notes, struggles, and best practices with other CLE Connect members. Have a specific question about the course, or how it applies to your practice? Ask Terrie! Even after you complete your course(s), you will have access to the discussion board. Like we said, the CLE credits are just the icing on the cake. Things have changed in the CLE world! Many progressive states now offer lawyers the option of securing CLE credit on-demand. The honor system at its best. CLE Connect has been created just for you. Now, you can learn valuable marketing tips and strategies that will help you attract new clients from the comfort of your office. Once you have completed a CLE Connect course, you will receive a Certificate of Completion for submission to your state bar association. Access state-specific CLE information here.